With an illustrious acting career spanning more than 50 years, ACADEMY AWARD Nominee Robert Mitchum was one of Hollywood’s most iconic and memorable leading men. Although widely known for his “tough guy” roles in classic film noir dramas, Mitchum’s powerful on-screen charisma proved equally effective in all movie genres — from comedy and romance to Westerns and war films — leaving an indelible mark in cinematic history. I have to say, before watching this collection I couldn't remember for the life of me who Robert Mitchum was, but when I told my husband that I was offered this collection for review he told me to hurry up and say yes. Apparently he could remember vividly about this actor and remembers watching some of the movies with his dad. So me being the awesome wife that I am, I watched a couple of movies with my husband over the weekend while we did laundry. I have to say, I absolutely loved watching River of No Return and loved that I got to see Marilyn Monroe in this movie as well. I also loved seeing Kirk Douglas in The Way West. 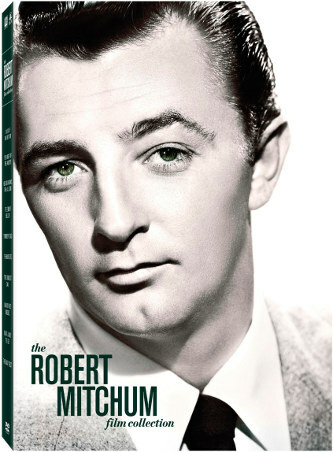 This collection not only has ten of Robert Mitchum films he starred in, but the collection itself also has shots of images inside the cover of Mitchum himself. If you are or know of anyone who is a Robert Mitchum fan this is definitely something you need to have or give for your next collection. Disclosure: All opinions are my own. I received the Robert Mitchum Collection at no cost for the purpose of this review. No other compensation was received.